This tutorial gives states some direction on how to best implement ICOTS. Topics covered are: Help desk, user load, setting up workflow, managing case load, legacy data, duplicate records, and pending cases. 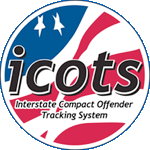 The ICOTS Implementation Guide will offer direction to states on specific features such as accessing the Help Desk, setting up workflow, reassigning cases for legacy data, managing legacy data, minimizing duplicate offenders and cases, and how cases pending at the time of implementation will be handled.